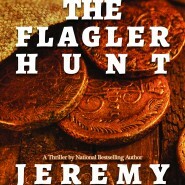 Jon Rickner returns in THE FLAGLER HUNT, but this time, he’s got his brother by his side! In this prequel to FROM THE ASHES, the Rickner brothers must unravel a centuries-old mystery full of Gilded Age decadence and Conquistador treasure! 1565 – Just hours after perpetrating a grisly massacre against heretic Frenchmen on the shores of the New World, a Spanish admiral and an ambitious priest conspire to commit an audacious crime against the Crown. 1891 – A pioneering railroad tycoon creates a massive city-wide parlor game inspired by Robert Louis Stevenson’s Treasure Island for his wealthy guests, only to scrap the plans at the last minute thanks to a shocking discovery that could destroy everything he had built. Present day – Jon and Michael Rickner plunder an original Edison wax cylinder from the burning wreckage of an antiquities shop, only to realize that it is the first piece of a long-buried treasure hunt hidden in America’s oldest city. Matching wits and speed with a murderous rogue archeologist, Jon and Michael must piece together the forgotten remnants of Henry Flagler’s abandoned secret project before an incredible legacy and an unfathomable treasure are lost forever. For more on this action-packed adventure, check out my new page for THE FLAGLER HUNT!